These errors popped when trying to play the video so we started with working out why it was saying the client was blocking various things. At first we thought it was a uBlock Origin or web filter issue. The web filter showed nothing being blocked, so that was an immediate dead end. We deploy uBlock Origin out to all machines via Group Policy, so next we started adding domains from the error console to the whitelist. Though this did reduce the number of “ERR_BLOCKED_BY_CLIENT” errors it didn’t fix the actual issue, so we eventually started disabling or removing the extension entirely but this too had no effect. 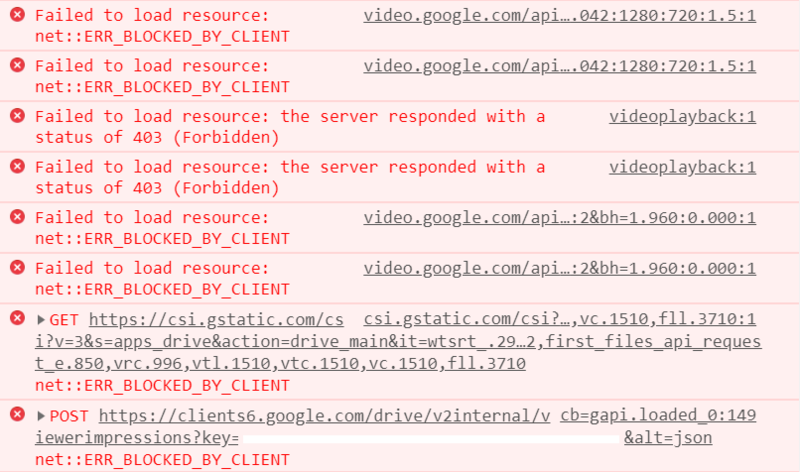 It turns out that all that uBlock Origin was doing was disabling the google tracking stuff, not actually hampering the video playback. Whilst testing this we identified that the issue only occured for people who were signed into Google Chrome (the browser itself opposed to the website) or were using a Chromebook. We realised that the issue must be a setting in the G Suite managment console that has caused this. After further digging around in the audit logs we found that we had disabled Third Party Cookies for the whole organisation at around the same time as this issue begun to appear on our helpdesk. By re-enabling these cookies we were able to get the videos to load properly for every user. You can enable/disable Third Party Cookies on G Suite Admin Console by searching for “third party cookie blocking” or by navigating to Device Management > Chrome > User Settings. You can also disable or enable Third Party Cookies in the Chrome browser itself by clicking the three dots menu icon > Settings > Privacy and security (under “Advanced”) > Content Settings… > Cookies. Clicking here (if you’re using chrome) should work, too. There’s an option there to (un)block third party cookies. It would be nice if Google could make their player work without third party cookies, however for us being able to view videos on Google Drive is pretty important so we have re-enabled it for now.